It’s difficult to single out one book. Rather, I’ve been inspired by the ‘material turn’ in medieval studies that has been gathering pace in recent years. The collection of essays titled Animal, Vegetable, Mineral: Ethics and Objects (Punctum Books, 2012), edited by Jeffrey Jerome Cohen, is really vibrant and innovative, and gave me the confidence to ask provocative questions about the material I was researching: such as, what happens when we cease to assume that only humans exert agency? None of the essays in that collection deal with the many ‘speaking objects’ found in Old English literature (the Exeter Book Riddles, The Dream of the Rood) or Anglo-Saxon material culture (the Alfred Jewel, the Brussels Cross and Ruthwell Monument) so there was still scope to apply many of its bold claims and ideas to my own area of medieval studies. 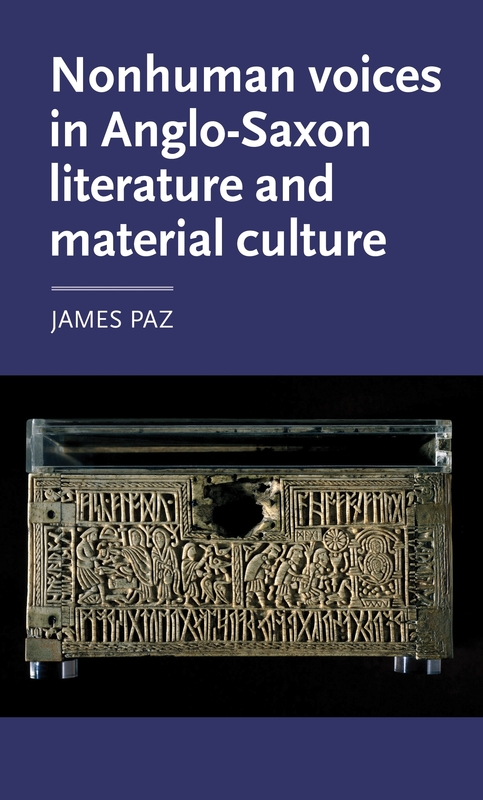 As one of the aims of my research was to get to grips with the materiality of Anglo-Saxon things, I tried to visit every manuscript, artefact, monument and environment I was writing about. This took me to places such as the British Museum, London, in order to look closely and carefully at the intricate carvings on the Franks Casket; to Dumfriesshire, Scotland, to see the huge, six-metre high Ruthwell Monument and get a sense of how it commands space and demands movement from its viewers; and also to the tidal isle of Lindisfarne, off the northeast coast of England, to experience the elemental fluidity of Lindisfarne and the Farne Islands. I loved spending time with my primary sources, and returning to them again and again with new theories and questions. Anglo-Saxon poetry and artwork is packed with verbal and visual riddles. You can read a riddle from the Exeter Book and think you’ve solved it as, say, ‘fish and river’ and then read it once more and the solution suddenly appears to be ‘soul and body’. You can look at the Sutton Hoo helmet and see the face of a human warrior, but then look it again, from another angle, and it shifts shape into a winged dragon. These things really do speak back to us, supplementing and sometimes challenging modern ideas about human and nonhuman lives and voices, about embodiment, materiality and substance. I found the new ideas emerging from ‘thing theory’ and related branches of new materialism to be exciting and energising, but it was difficult at times to keep pace with them. Since I began working on this research project, in 2008, scholarly interest in the secret lives of apparently inanimate objects has only increased. New conference papers, articles and books applying ‘thing theory’ to literature and culture kept on coming and I had to keep revising my own ideas in light of them. Of course, early career academics have to balance the task of writing their first monograph with many practical challenges, too, such as moving to new cities and institutions, starting new jobs, writing new lectures, planning new classes, etc. You have to be very self-disciplined and protect your research time. This is my first monograph, but I have published a collection of essays about Medieval Science Fiction (KCLMS, 2016) as co-editor with Carl Kears. Fantastic! Research and writing can be a lonely pursuit, and at times you wonder whether anyone else cares about the work you are doing, so it’s great to be able to have something tangible to show for that work and to be able to share the book with friends, family, students and colleagues. I think it’s important to publish a first monograph with a large, respected university press like MUP. 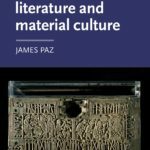 The Manchester Medieval Literature and Culture series is receptive to innovative approaches and offers an excellent platform for medievalists who want to take the field in new directions. The series has also published some work by Anglo-Saxonists I admire, such as Daniel Anlezark’s Water and Fire: the Myth of the Flood in Anglo-Saxon England (MUP, 2006). This is the longest, most rigorous and time-consuming project I’ve worked on to date. As mentioned, I started the research in 2008 when I was still a PhD student but I continued to work on it during my first three years as a full-time lecturer at the University of Manchester. What sets it apart from some of my previous publications is that it was quite closely linked to my teaching, especially the research-led, third-year course unit I designed. The theme of the course is ‘nonhuman voices’ in Anglo-Saxon literature, which means that I had to write lectures and lead seminars on texts and topics that the book deals with. This forced me to think carefully about making my research accessible and interesting to non-specialists, something which the book has definitely benefited from. I’m beginning to lay the groundwork for my next research project, which is intended as an intervention in the burgeoning field of literature and science: a field which is starting to show how these two disciplines may have a constructive influence on each other but which, to date, has neglected premodern (especially early medieval) perspectives. The project will be based around two research questions: (1) What did ‘science’ (Latin scientia) mean and how did it work in an early medieval context? I will begin by exploring the relationship between scientific and other forms of knowledge (religious, magical) in Anglo-Saxon manuscripts. Then I will reassess how scientia worked for the writers of these texts. If, as many new materialists claim, the boundaries between human and nonhuman lives were more fluid before Enlightenment empiricism, how could a detached observation of the natural world take place? (2) How did scientific and literary ways of knowing intersect? Long before the gulf between the ‘Two Cultures’ the world was believed to have been spoken into creation by the Word of God, meaning that language held profound power over true and illusory knowledge. 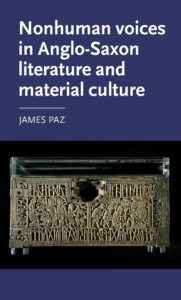 How, then, do literary languages and forms shape scientific understanding in early medieval texts? Looking ahead, I’d also like to gain experience of assembling and leading a team of researchers, and managing a research project incorporating collaborative activities. Working alongside Anke Bernau, I co-organised a one-day workshop which gathered a small group of scholars together in order to explore the manifestations and significations of ‘craft’ in premodern culture. This theme may lend itself well to further collaborations, both with other academics and with practitioners and institutions such as museums, as well as public engagement activities. Nonhuman voices in Anglo-Saxon literature and material culture is available now! Visit the Manchester Medieval Literature and Culture series page, here. Category: Author Q&A, Blog, History, material culture	0 Comments.